Bring the Books: You're On Notice, Fellas! I love this. It took me about 7 takes to realize that you made this. 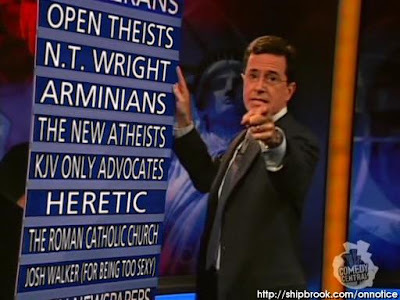 I guess the first 6 times I was just so shocked to see Colbert talking about N.T Wright and Open theism that I did not read all the way to the bottom to see the last one, which is the best one!!! Just for you, big guy.